The iconic masterpiece of India that introduced the world to "a glittering novelist-one with startling imaginative and intellectual resources, a master of perpetual storytelling" (The New Yorker) WINNER OF THE BEST OF THE BOOKERS • SOON TO BE A NETFLIX ORIGINAL SERIES Selected by the Modern Library as one of the 100 best novels of all time • The twenty-fifth anniversary edition, featuring a new introduction by the author Saleem Sinai is born at the stroke of midnight on August 15, 1947, the very moment of India's independence. Greeted by fireworks displays, cheering crowds, and Prime Minister Nehru himself, Saleem grows up to learn the ominous consequences of this coincidence. His every act is mirrored and magnified in events that sway the course of national affairs; his health and well-being are inextricably bound to those of his nation; his life is inseparable, at times indistinguishable, from the history of his country. Perhaps most remarkable are the telepathic powers linking him with India's 1,000 other "midnight's children," all born in that initial hour and endowed with magical gifts. This novel is at once a fascinating family saga and an astonishing evocation of a vast land and its people-a brilliant incarnation of the universal human comedy. Twenty-five years after its publication, Midnight' s Children stands apart as both an epochal work of fiction and a brilliant performance by one of the great literary voices of our time. SALMAN RUSHDIE is the author of thirteen previous novels--Grimus, Midnight's Children (winner of the Booker Prize and the Best of the Booker), Shame, The Satanic Verses, Haroun and the Sea of Stories, The Moor's Last Sigh, The Ground Beneath Her Feet, Fury, Shalimar the Clown, The Enchantress of Florence, Luka and the Fire of Life, Two Years Eight Months and Twenty-Eight Nights and The Golden House--and one collection of short stories: East, West. He has also published four works of nonfiction--Joseph Anton, The Jaguar Smile, Imaginary Homelands, and Step Across This Line. Recognized with numerous awards, he is a member of the American Academy of Arts and Letters and a Distinguished Writer in Residence at New York University. A former president of PEN American Center, Rushdie was knighted in 2007 for his services to literature. "Extraordinary . . . one of the most important [novels] to come out of the English-speaking world in this generation." "The literary map of India is about to be redrawn. . . . Midnight's Children sounds like a continent finding its voice." "In Salman Rushdie, India has produced a glittering novelist- one with startling imaginative and intellectual resources, a master of perpetual storytelling." "A marvelous epic . . . Rushdie's prose snaps into playback and flash-forward . . . stopping on images, vistas, and characters of unforgettable presence. Their range is as rich as India herself." "Burgeons with life, with exuberance and fantasy . 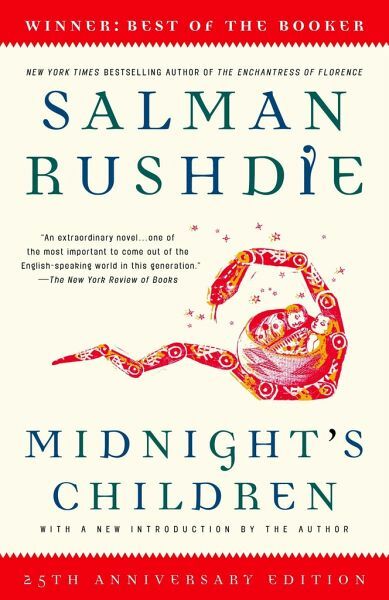 . . Rushdie is a writer of courage, impressive strength, and sheer stylistic brilliance." "Pure story-an ebullient, wildly clowning, satirical, descriptively witty charge of energy." 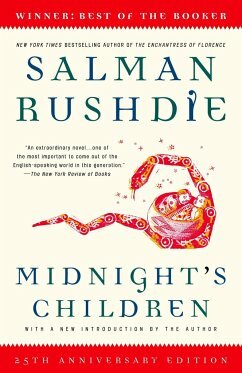 "Rushdie’s novel took a post-colonial “empire fights back” spirit, and a deep personal understanding of the politics of Indian partition, and exploded them into something teeming with imaginative life… He inhabits a hybrid consciousness, with a telepathic connection to the other children of midnight, and tells its stories for all he is worth." Beautiful edition of this book. Came quickly and in perfect conditions.